Wireless And Wired Security Systems: What’s Best For Your Home? | Calgary Alarm Inc. The most important investment you can make when it comes to your safety is a security system. If you are on the market for one, you have two choices: wireless or wired. What’s the difference and what’s best for your home? Wireless systems use radio signals to communicate between the control panel and sensors. Wired security systems, on the other hand, are hardwired to the home with wires running from the control panel to each sensor. Because these two alarm systems communicate differently, they each offer their own set of benefits. One of first benefits of a wireless security system is that it is so easy to install – in fact, many people can get away with doing this entirely themselves. Your home will not have to be outfitted to accommodate the alarm system. This makes them very portable as well. Therefore, if you live in an apartment or condominium or in an older home, or your home has a lot of brick inside, a wireless security may be the better choice. The audio and video footage is often better as well. It is also possible to make upgrades to your wireless security system via the addition of more sensors – no hardwiring is necessary. In addition, if you are a fan of smart homes, wireless security systems make it possible to monitor your home and security system via your smartphone. These systems can also connect to a remote monitoring centre. As far as cons go, in wireless security systems, the signal can be interfered with or potentially hacked. However, technology is always evolving, and solutions to these issues will be available in the future. Wired security systems are generally considered more reliable because they do not suffer from signal interference and it is not possible for them to be hacked into. They also use a backup battery during various interruptions that sometimes occur. They are also less expensive than wireless security alarms. 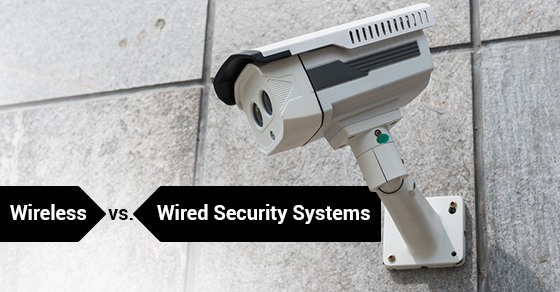 While there aren’t any cons to installing a security system when it comes to staying safe, wired security systems are not as easy to install – they require hardwiring of your home and professional installation. After you’ve considered the benefits of each system, whether you choose a wireless or wired security system will all come down to your current lifestyle and type of home.